In 1995, two women caused a social stir when they released The Rules, an advice book aimed at single women who wanted to not only attract a successful man, but keep him. 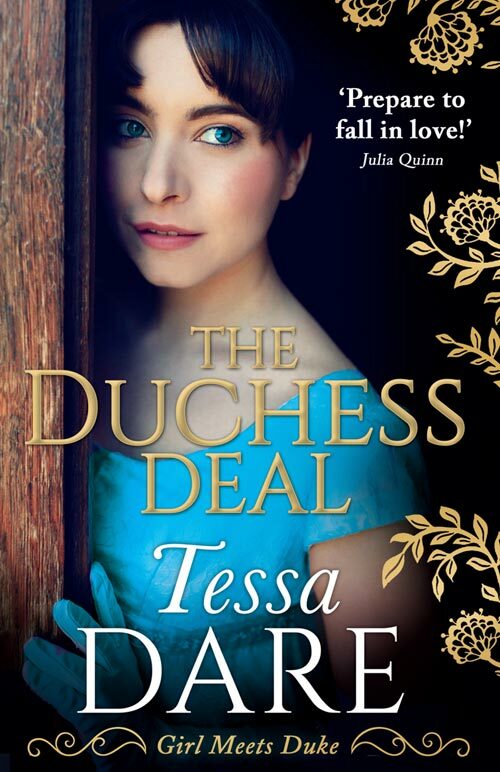 Seeing as how The Duchess Deal takes place in late Regency England, heroine Emma Gladstone has most definitely not read The Rules. Nonetheless, within a mere quarter hour of meeting the Duke of Ashbury, she finds herself the recipient of a marriage proposal. The duke is wounded, bitter, jaded, imposing, horrifically scarred from a war injury, and generally disagreeable. He has little to recommend himself as a suitor, save for his title and money. Fortunately for him, Emma is poor and lacks options. It’s a match. At the outset, Ashbury insists on defining the boundaries of their arrangement. Since the marriage is strictly for the purposes of creating an heir, he will confine their interaction to nightly conjugal visits. Once Emma is pregnant, they’re through. Or so he thinks. As it turns out, even a duke can’t defy a few essential rules of romance. #1: A relationship isn’t one-sided. Ash is accustomed to having his way. Negotiation is not in his repertoire. However, he quickly learns that his bride is no pushover. Emma insists on adding some conditions of her own. In particular, she demands that they have dinner together every evening. In a marriage of convenience, Ashbury reasons, there’s little reason to become acquainted. The less talking, the better. To his displeasure, Emma insists on conversation. Not only at dinner, but at other times of the day, as well. Even in bed. Especially in bed. And just as he feared, all this talking begins to draw them closer. It even leads to emotions. So inconvenient. #3: Rules shouldn’t be carved in stone. People change. Even dukes. Before long, Emma has taken a sledgehammer to every rule and condition designed to protect them both. Any romance reader knows it was bound to happen. In the end, the heart is a disobedient thing. Love refuses to be controlled. And relationship rules, like all rules, are meant to be broken.